The Direct Sales industry in Canada has tremendously increased for the past years considering the significant growth of Direct Sales companies in the country. This situation has influenced many women and even men to join the Direct Selling business, leaving them a significant number of companies to choose from. Ishopathome would like to thank all respondents on this survey. May this survey give those who want to join this business an idea on what company to build their direct selling career on. But be reminded that choosing a Direct Sales Company is not like a survey or multiple choice to choose from, it can be your lifetime career that is at stake. So we at Ishopathome suggest that you visit these companies’ pages here in our website to give you a glimpse of their profiles and products and do your own research from there. DOWNLOAD YOUR FREE GIFT HERE. I am surprised Norwex didn’t make the cut as it has wonderful chemical free household and personal products. The sales reps are well rewarded as are the hostesses during demos. Great company, great products!! I guess it’s time we update this posts. Can you give me 3 things that makes Norwex a great direct sales to work for? I’m so surprised Steeped Tea didn’t make the list. Since it’s uber-successful appearance on Dragon’s Den last fall, this little gem of a company has grown over 300%. Having recently opened the border into the US, and with some exciting Dragon’s Den recaps & Chatelaine awards coming up, a lot of eyes are watching this successful company! I’m excited to be part of this Canadian success story! Our products are so amazing. Best fragrances and best burning candles in the world. 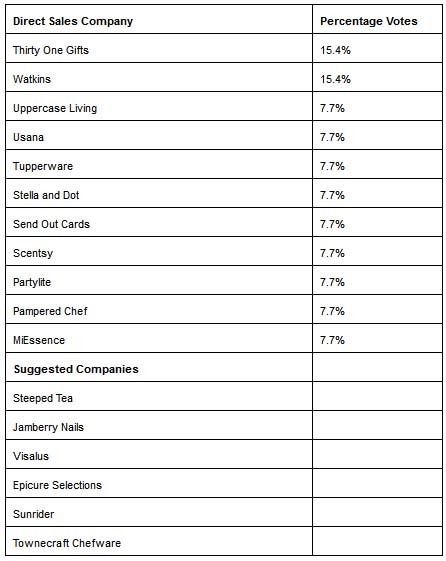 Just adding my thoughts to what Michelle said, Steeped Tea is a fast growing company and should be listed on this list 🙂 That’s also one of the reason I am one happy user and rep for Steepedtea! There is a new player in Canada and the results are amazing! All-day natural energy, mental clarity, pain management, digestive & immune support, weight loss and so much more. I am totally surprised Arbonne International didn’t make the list. Hi Nicole, it could be because no Arbonne rep replied to our survey. Are you an Arbonne rep in Canada? Can you please provide the total number of participants (votes) in this survey. Hi, I am working for an amazing company that has only been in Canada since July. They have a beautiful product, empowering coaching, and an awesome compensation plan. you should check them out! What company is it Deborah? You should also take a peek at http://www.locketsbyamber.origamiowl.com. They are the original company that created the living locket concept…South Hill Design came on the scene after. Very surprised Organo Gold Enterprises Inc is not here?! It is the only Canadian company in the top 100! Two of the co-founders are Canadian. Our head office is in B.C. I invite you to check out our site. I am really excited to announce that Origami Owl is officially live in Canada. I have been selling for 2 years this company is amazing! We have one of the best comp plans out there, we are offered health insurance, and our product is in extremely high demand. Origami Owl grew 870% in 2013 and it was only in it’s 2nd year as a direct sales company. The fee to join is only $150 and I would love to have anyone interested join me! Just recently launched in Canada, Your Inspiration At Home is on the rise …. our global consultant base has DOUBLED from 5,000 to 10,000 in the past 6 months! Check us out – as THE most awarded direct sales food and drink company in the world, we are sure to be followed quite quickly! YOU could be among the FIRST in your area! I’m surprise this didn’t make the list either! They have an amazing product line, naturally based, cruelty free and some are even gluten free and vegan! A portion of sales help support sexually abused women! I love this company, what they stand for and their products! Thanks for the article, some great info. This is an interesting list, but why would you do a survey? Why wouldn’t you list them by sales $$$? The whole point of wanting to work from home or do your own business is to make money. I would want to know which ones make the most money. Especially in Canada, because we have differences in our market compared to the U.S.
That’s an interesting question and you have a point. But money and sales is only a fraction of the equation. And like you said, we all have differences. We also have preferences. One would not just choose a company base on their sales alone, because sales doesn’t guarantee future earnings, profitability, and fit to individuals looking to create a business. keep Collective is live in Canada! With over 12,000 designers in the US now is the time to become a founding designer and rise to the top! $169 CAN for the opportunity to change your life. Customizable jewelry brought to you by the founders of Stella & Dot. Surprised doTERRA has not made it on that list, Lauched Canada June 2016 and is one of the top companies right now. Big BIg things happening. I didn’t know it’s in Canada now. That’s awesome! What makes it a great company? Magnolia and Vine is a dynamic NEW Direct Sales company IN CANADA offering women the opportunity to express their own unique style. Whether they Shop, Host or Join, our beautiful customizable jewellery and accessories inspire women to look and be amazing. Our initial collection is completely interchangeable helping women to create a look that expresses their personal style. Start by choosing from one of our fabulous base jewellery or accessory pieces and add on our interchangeable snaps to create a look all their own. There are over 500 Snap designs to choose from and our collection will continue to evolve and grow. Magnolia and Vine just announced the purchase of Miche’s patents, trademarks and copyrights in the USA along with a license to sell their patented interchangeable handbags in Canada which is creating huge growth! Magnolia and Vine offers a wonderful company paid hostess program and on-going buy 4 snaps, get your 5th for FREE guest specials that will increase your orders, party averages, bookings along with the number of people looking to join your team. Join today and earn cash commission PLUS extra FREE product through our Fast Start program. Contact us today at caza@cogeco.net to learn more about joining our team! We’re excited to help women be themselves! Tocara is a Canadian company that sells beautiful quality jewelry at great prices and should be checked out as well!! Peekaboo Beans is a Canadian based direct sales company providing childrens apparel that is completely functional, fashionable and enables children to play in comfort and style.